TUCSON, Ariz.— Monsanto, producer and seller of Roundup and its toxic active ingredient glyphosate, is the recipient of the Center for Biological Diversity’s 2015 Rubber Dodo Award, given annually to those who have done the most to destroy wild places, species and biological diversity. Glyphosate is now used in more than 160 countries, and more than 1.4 billion pounds are applied each year. It has been classified as a “probable human carcinogen” by the World Health Organization and its heavy use, particularly on herbicide-resistant GMO crops, also developed by Monsanto, is considered a leading cause of the recent, drastic 80 percent decline in monarch butterflies. 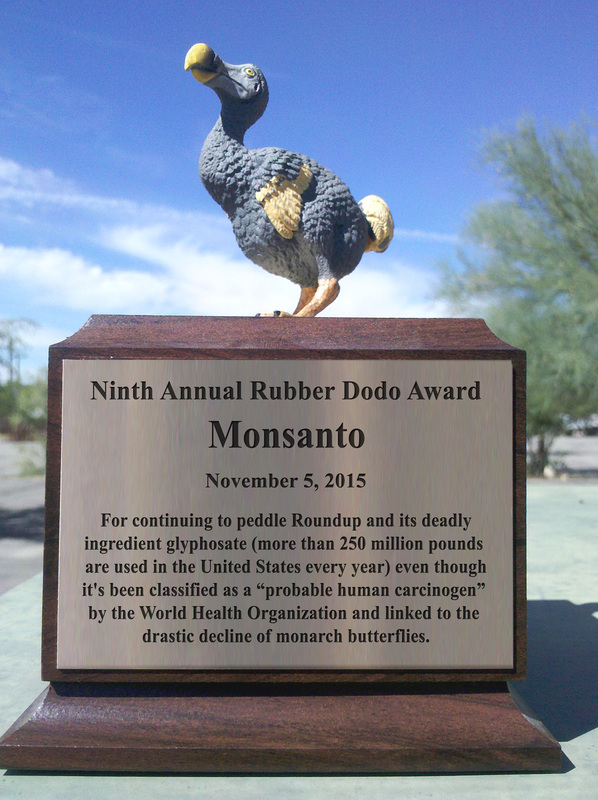 Previous Rubber Dodo winners include U.S. Department of Agriculture’s Wildlife Services (2014), the Koch brothers (2013), climate denier James Inhofe (2012), the U.S. Chamber of Commerce (2011), former BP CEO Tony Hayward (2010), massive land speculator Michael Winer (2009), Alaska Gov. Sarah Palin (2008) and Interior Secretary Dirk Kempthorne (2007). Earlier this week the Center released an analysis that found more than half of the glyphosate sprayed in California is applied in the state’s eight most impoverished counties, where the populations are predominantly Hispanic or Latino. More than 15,000 people cast their votes in this year’s Rubber Dodo contest. Other official nominees were Volkswagen, Sen. John McCain (R-Ariz.), Exxon and notorious Nevada rancher Cliven Bundy.